Posh defender Michael Bostwick claims the late equaliser against Coventry. Surprisingly there are some who believe Peterborough United would have a better chance of promotion from League One by selling Marcus Maddison. Presumably these ‘experts’ would promote batting against Ravi Ashwin with one hand tied behind your back or fighting Anthony Joshua while wearing a blindfold. Better surely to use every available asset to win a sporting contest? Michael Bostwick's header finds the corner of the bet to give Posh a draw against Coventry. Photo: David Lowndes. Of course Maddison can frustrate and infuriate - usually when appearing to audition for RADA - but mercurial talents don’t always have impeccable manners. It’s part of the maverick’s make-up. For every Alastair Cook there’s a Shane Warne. Maddison can be a luxury and a loose cannon, but he can play. The quite brilliant cross he delivered for Michael Bostwick to head home a 93rd minute equaliser won’t be bettered all season. He ran onto a pass from fellow substitute Shaquile Coulthirst and hit a deep cross at pace with his weaker right foot to climb back to the top of the League One assist charts. That’s right. A player who supposedly puts himself first has created more goals for team-mates than any other player in the division bar Scunthorpe’s ace midfielder Josh Morris (they both have nine). Sadly it ‘only’ led to a point for Posh against a Coventry team who arrived at the ABAX apparently in disarray, but who actually performed with great spirit and impressive organisation. Posh star Marcus Maddison is stopped in tracks by Coventry defender Dion Kelly-Evans. Photo: David Lowndes. Maddison’s arrival midway through the second half did most to stop the Sky Blues ending a run of seven straight League One defeats with a victory few would have begrudged them. Posh were disjointed and woefully inaccurate in the first-half. They were better in the second-half, but still frantic when they needed composure and hurried when they required calm. Only when Maddison’s sent a searing half volley at goal did Coventry ‘keeper Lee Burge need to make a save, although Bostwick’s header from a late corner and Ryan Tafazolli’s poke at goal did signal a possible sting in the tail. Credit to Coventry though who had won just one away game all season. New manager Russell Slade’s gameplan involved massed defence and speedy breaks, usually through impressive left-winger Kyel Reid, and it was enough to befuddle and bemuse a Posh team who found it hard to find any attacking momentum. Posh striker Lee Angol takes on the Coventry defence. Photo: David Lowndes. Slade admitted he was ‘hurting’ after the game, and not only because he felt Posh had committed a foul before Couthirst started the move that led to the equaliser. His captain Jordan Willis had bundled Coventry in front on 19 minutes after fatal hesitation from Posh full-back Michael Smith as a cross was deflected into the penalty area. The Sky Blues rarely threatened a second goal, but they rarely looked in danger of conceding either. Before the break Posh were laboured in possession. Paul Taylor kept picking the ball up in deep positions and kept losing it before he could find penetration, while Leo Da Silva Lopes had a spell when everything he touched went wrong. Lee Angol’s surge into the penalty area on the half hour was impressive, but his decision to keep the ball rather than pass to Tom Nichols was less so. Nichols then accepted a long pass, powered into the penalty area, but slipped the ball behind Angol who was waiting for a tap-in. Angol’s header from a deep Forrester cross was held by Burge early in the second-half before Posh whipped up a strong breeze rather than a storm in the final minutes, although Coventry looked to have weathered it. The late celebrations at the ABAX were borne of relief rather than pride. 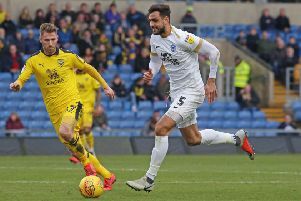 This is the fifth home draw against a team currently sitting in the bottom half of League One of the season - Posh have won just five of 13 home games and that stat alone is keeping them out of the play-off positions for now. What had become a ‘must-win’ game before kick off turned into a lucky draw. They need to be better in 2017 if the dream of Championship football is to be realised. Posh: Luke McGee, Michael Smith, Andrew Hughes, Michael Bostwick, Ryan Tafazolli, Chris Forrester, Gwion Edwards, Leo Da Silva Lopes (sub Callum Chettle, 66 mins), Paul Taylor (sub Marcus Maddison, 65 mins), Lee Angol, Tom Nichols. Unused substitutes: Shaquile Coulthirst,Mark Tyler, Brad Inman, Hayden White, Jerome Binnom-Williams. Coventry: Lee Burge, Jordan Willis, Jordan Turnball, Lewis Page (sub Dion Kelly-Evans, 46 mins), Jamie Sterry, Andy Rose, Kyel Reid, Chris McCann, George Thomas (sub Jody Jones, 64 mins), Marcus Tudgay (sub Marvin Sordell, 77 mins), Ben Stevenson. Unused substitutes: Riece Charles-Cook, Gael Bigirimana, Ruben Lameiras, Daniel Agyei. Posh: Bostwick (90 + 3 mins). Posh: Da Silva Lopes (foul), Bostwick (foul).